It was 2013 and I was 16. I had a very abnormal swelling on my leg that wouldn’t go away and was getting bigger and bigger. I eventually got a referral to see a specialist. I had a biopsy, an X-ray and an MRI scan. I got told very quickly that there was something very worrying going on and I was sent to see an oncologist. I was given the very bad news that I had alveolar rhabdomyosarcoma, a rare type of soft tissue cancer. They needed to find out quickly if it had spread. I had a bone marrow biopsy, a bone scan, a CT scan and many blood tests. They found it hadn’t spread and was localised to the ankle bone area in my right foot. They inserted a Hickman line for my chemotherapy regime. I was given Ifosfamide, Vincristine and Dactinimycin which involved two nights as an inpatient, followed by a 30-day break so that my blood count could recover. The regime was pretty yucky and I threw up a lot. I was very tired for a few days but quickly recovered in each cycle. 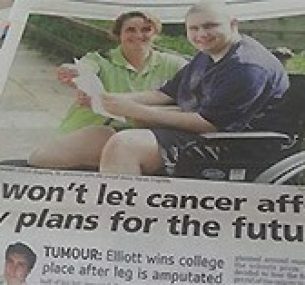 I had four cycles of chemotherapy, followed by a below-the-knee amputation. This was necessary because even though the tumour had shrunk with the chemo, it was wrapped around key nerves in my foot. The surgeon would have had to cut these nerves which would have made my foot useless. So removing the tumour, and having clear margins, was the best decision and meant radiotherapy wouldn’t be needed. One month after surgery I was walking with my new prosthetic leg. Not long after I was running! I continued with five more cycles of chemotherapy to kill any cancerous material that may be floating around. After this frontline treatment my oncologist offered to put me on a randomised clinical trial of six cycles of daily, low dose, Cyclophosfamide and Vinorelbine. This would be once a week, amounting to an additional six months of treatment. Since my type of cancer is so rare and aggressive and deadly, with only one in a million people being diagnosed, I happily agreed. Clinical trials are randomised to avoid bias – the computer said ‘yes’ to me. I signed my consent and started a month later, after Christmas. I tolerated the treatment very well – it was a maintenance chemo and I only felt tired on the day I was given Vinorelbine, but I recovered quickly. I had to stop taking the Cyclophosfamide tablets and miss the Vinorelbine a couple of times because of a low blood count. I had a Hickman line infection just after the seventh cycle. I was quickly admitted to hospital because of a temperature spike and was given antibiotics for two weeks. When the trial was completed I had a chest infection and was given Voriconazole antibiotics for two months. 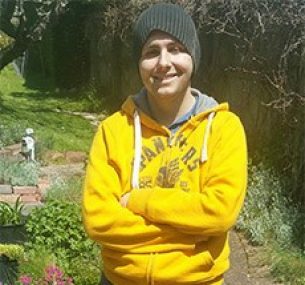 My end-of-treatment tests followed, and I was told that I was cancer-free. My Hickman line was removed and, for the foreseeable future, I just needed three-monthly MRI scans and chest X-rays. One year later, in July 2015, it was confirmed that my cancer was back. A PET scan showed it was really small and localised in my below knee stump. It hadn’t spread anywhere else. I got transferred to one of the best UK adult hospitals where my team consisted of two oncologists and a professor. 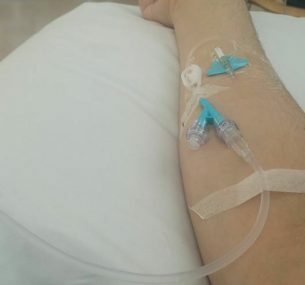 I started a new chemotherapy regime of Vincristine, Irinotecan and Temozolomide which involved coming in every day for 10 weekdays, followed by a week’s break. This regime made me really tired and I had several episodes of diarrhoea, despite all the medication they gave for it. I also suffered from neuropathy in my fingers. After two cycles I achieved an unexpected good response. But following two further cycles of chemotherapy to shrink it more, it had stayed the same. To try and get rid of it for good it was decided to amputate to above my knee – the literature says the more clear margins you have the better. The post-surgery pathology results were good – the surgery had been successful! I did a PET scan and was told I was in remission. We discussed more chemotherapy, but decided against since it was making me really unwell. We would continue with the three-monthly routine follow-ups. 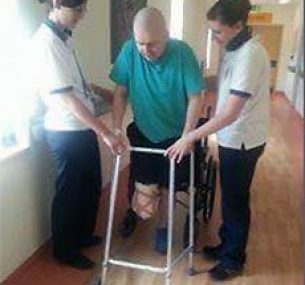 When I had finished physiotherapy with my hydraulic sensor knee prosthetic leg I had achieved the second highest walking distance over two minutes – one of the best the hospital has ever seen! It is now 2016 and I returned for my first three-monthly check-up. The alveolar rhabdomyosarcoma had come back in four places. There was one small lesion in the soft tissue at the bottom of my stump again, a 6cm lesion inside the femur bone in the bone marrow, and two 1cm lesions on my left lung. I have completed one cycle of Vincristine, Cyclophosfamide, Doxorubicin and Etoposide (VCDE). This involved three nights as an inpatient, followed by a two and a half week break. In week one of the break, I was admitted to hospital with an infection and a temperature. I was treated with antibiotics. As I write, I have just had my second cycle of VCDE. I am having another PET scan next week to see how the four tumours have responded to the treatment. With those results we will discuss the next steps forward. As of the end of July 2016 I have completed five Cycles of VCDE chemotherapy and shortly after I got told the great news that I have no evidence of disease on my PET scan. By the end of October 2016 I had completed 28 cycles of radiotherapy to minimise the chance of recurrence. Unfortunately as of February 2017 my most recent PET scan I had for a check-up confirmed that my alveolar rhabdomyosarcoma has come back once again but inside my right lung and also a tumour that is sticking out of my back on my spinal column. My oncology team has now recommended chemotherapy drugs Gemcitabine and Docetaxel and I started treatment two weeks later. Within me completing half a session of chemotherapy I got admitted into the hospital for a chest infection, but also discovered that I had a build-up of fluid and also evidence of progressive disease which was taking up nearly a quarter of my right lung. My oncology team told me since I have hardly had much treatment at that point, this doesn’t change my treatment plan but it is very worrying and hope that I start responding to treatment soon. Whilst I was in the hospital I got treated with IV antibiotics, and got the build-up of fluid removed under local anaesthetic. As of right now I have completed two and a half cycles of Gemcitabine and Docetaxel and me and my oncology team are starting to notice that I am starting to show signs of responding to treatment. My tumour on my back has got smaller. And furthermore I went for a chest X-ray, and I then got a phone call that from looking at my X-ray that the disease that is in my lung and on my back is all getting smaller.